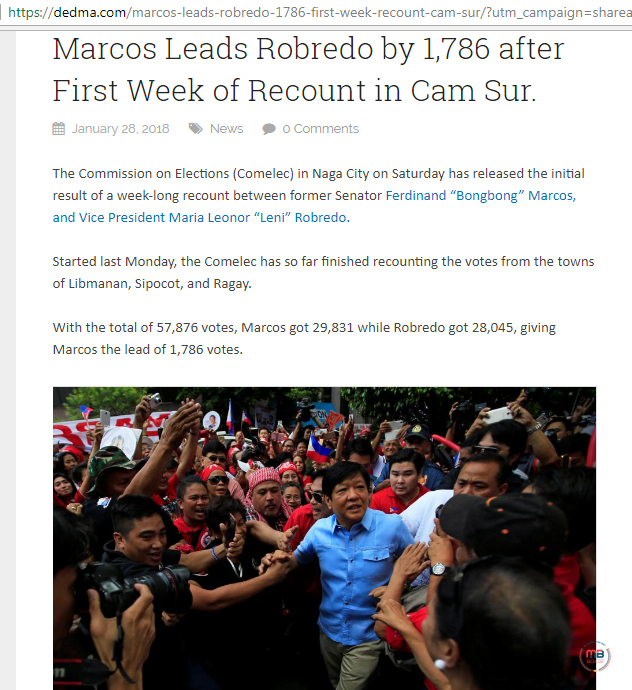 After repeatedly sharing the former Senator Ferdinand “Bongbong” Marcos Jr. will finally take the vice presidential seat this year, now a blog has claimed that Marcos already has 1,786 votes over Vice President Robredo after the first week of VP vote recount in Camarines Sur. 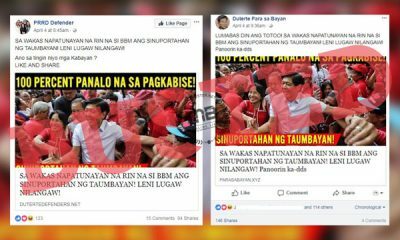 However, the story shared by “Philippine News Courier’s” Facebook page came from a dubious site, dedma.com, which has published fake stories, some of which we have debunked. According to the blog, Marcos is in the lead for having 1,786 votes more than Robredo as they each got 29,831 and 28,045 votes, respectively. It was said the recount is already completed for the towns of Sipocot, Libmanan, and Ragay and that 36 out of the 987 ballot boxes have been opened after the first week of recount. Recount was scheduled for February 2018. Reports said that the VP ballot recount is set to start in the second week of February. The first ballots to be reviewed are those from some specified clustered precincts in Camarines Sur, followed by other precincts in two pilot provinces, Negros Oriental and Iloilo, as cited by Marcos’ camp in their election protest. Ballot boxes from Camarines Sur were just brought to Manila. It was reported that 960 ballot boxes from the three districts of CamSur were brought to Manila in the morning of January 25 on Philippine Postal Office (Philpost) trucks, which were mandated to be driven at 50 kph, complete with police escorts. The ballots will be brought directly to the Supreme Court, where the recount will be conducted. The said report from ABS-CBN added that the rest of the ballot boxes from the fourth district of CamSur were scheduled for moving to Manila on January 27. 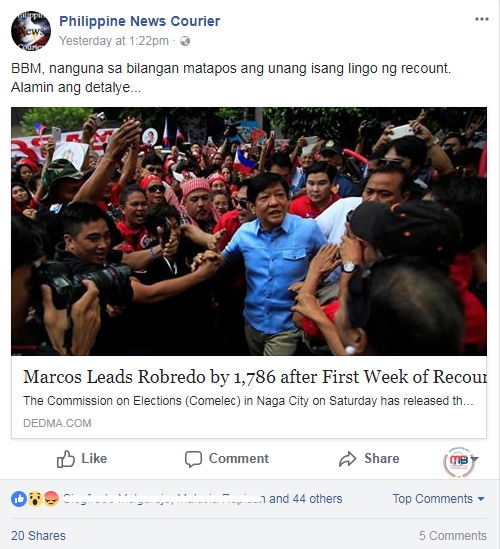 This meant that when dedma.com wrote the story and published it on January 28, it assumed that the first week of the first recount for the CamSur votes has already gone by. It even said, “The Commission on Elections (Comelec) in Naga City on Saturday has released the initial result of a week-long recount.” But this is not true, given how the ballot boxes only arrived at the Supreme Court in Manila by January 26, two days before the story was posted on the blog. So, what “week-long recount” were they referring to? Marcos just dared Robredo to allow for the vote recount to start. 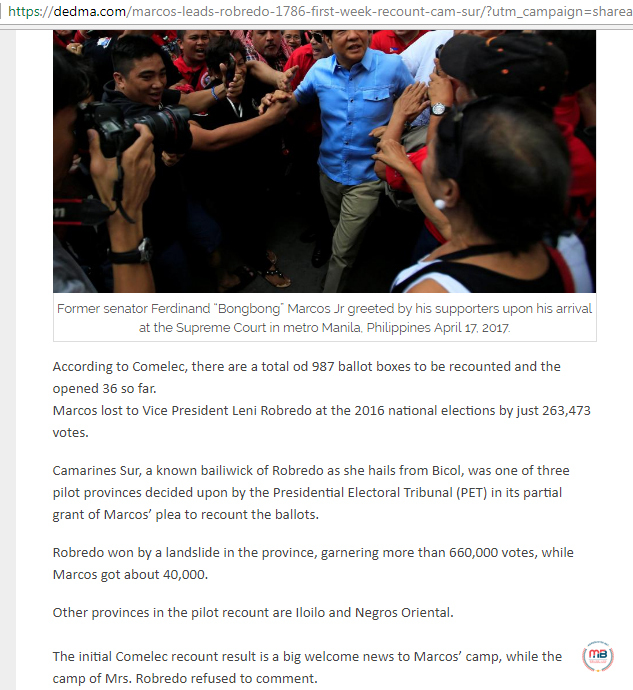 On January 29, a day after dedma.com’s story was published, Marcos called on for Robredo’s camp to drop their petitions in the same way that he would withdraw his pending petitions so both camps can proceed to the recount of VP votes. On the same day, Robredo’s camp has shot back at Marcos, telling him he was the only one to blame for the delayed resolution in his VP election protest for “filing a weak and flawed election protest” that required the Presidential Electoral Tribunal to resolve several preliminary matters before the protest can move on. The source of the story has posted a few fake stories before. Dedma.com was among the blogs that published the false stories about activist leader Renato Reyes’ son crashing a sports car, Reyes urging fellow smokers to boycott Phillip Morris, and Duterte wanting to ban public cursing. Robredo won over Marcos at the 2016 national elections by 263,473 votes. According to Robredo’s election lawyer, Romulo Macalintal, if Marcos fails to prove any substantial vote recovery from Camarines Sur, Negros Oriental, and Iloilo, his protest will be dismissed due to lack of merit. Earlier, Marcos confidently claimed victory over his election protest, citing it as the reason why he would not run for senator this 2019.